Title of the film is what catches the attention of the audience; make them curious about what the film will be about. And one such film is Chandigarh-Amritsar-Chandigarh, a quirky and an unusual title which has already made the audience look forward to the film’s release. Sharing the screen for this film are Sargun Mehta and Gippy Grewal, and the duo will be seen together in a film for the first time. Chandigarh-Amritsar-Chandigarh is being directed by Karan K Guliani, and is being presented by Sumit Dutt and Dream book and is being produced by A Leostride Entertainment Production. 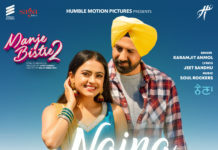 Ace music director, Jatinder Shah has given music to the film, another celebrated dialogue and screenplay writer Naresh Kathooria has written the dialogue and screenplay of the film. Seeing these amaze bunch of talented artist working on the film we already know that it is going to be a blockbuster. The makers of the film have shared the first look of the film. From the poster, it seems to be a light hearted and a true entertainer. The two actors seem to be in a jovial mood in the poster and the film is going to be a romantic-comedy. The film revolves around two characters that how this journey will impact their lives or will play role in their story. This film might be the proof of the saying which goes as ‘sometimes just a moment is enough’. Recently at award function, the two were even seen sharing the stage with much ease and comfort which proved that the audience will give thumbs up to this fresh pair. This glimpse that they gave to their fans has raised the level of excitement among the audience who are eagerly looking forward to the release of the trailer of the film. The worldwide distribution of the film will be done by Munish Sahni’s Omjee Group. The film will hit the theatres on 24th May 2019. Next articleYet another track ‘Saak’ from ManjeBistre 2 released!